My project for the Crystal Brush 2011 Awards held at Adepticon in Chicago. The model placed second overall! You can see the full creation process in my project documentation area: + + + Duchess Death documentation + + +. You can also see the model spin around on it's bizarre round base (Quicktime required) : Short version - 4 mb, Long version - 10 mb. 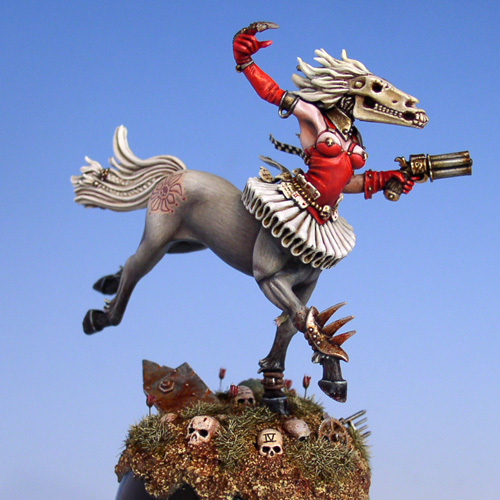 Obviously the model takes inspiration from many places - the works of Frank Frazetta, John Blanche, and a lot of other artists. Also several of my own projects have played their part in the creation process. You can vote for and comment on the model in my CMON-gallery: www.coolminiornot.com/277542.